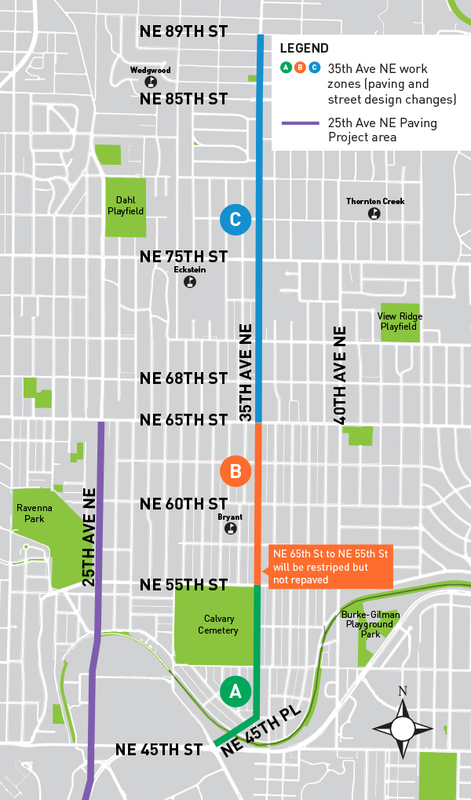 We’ve hired a contractor for our project on 35th Ave NE and are gearing up for construction to begin as early as mid-June. Read on for more about what to expect while we build the improvements, which include paving and street design changes to enhance safety and provide more transportation options. Look for more detailed information from us in the coming weeks. See below for a snapshot of what to expect during construction or view our construction factsheet for more detail. We’ll share more information in the coming weeks. Construction impacts that are typical of this kind of paving work include, but are not limited to: on-street parking restrictions, periodic traffic detours to nearby arterials, lane shifts around work zones, partial street closures, and pedestrian and bicycle detours around work zones. Work hours will typically be weekdays during the day, but some nighttime and weekend construction work may be needed to minimize impacts. You can expect to hear normal construction noises, like engines and other equipment, as well as louder noises, like pavement cutting. Short-term driveway restrictions, typically about an hour, will be needed when we remove the existing asphalt and when we pave new asphalt. We’ll notify you in advance. Regular updates via email and flyers distributed in advance of work near affected properties. Our outreach team will work with you to address any issues that may arise during construction. Please forward this email to those you think will be interested and encourage your neighbors, customers, or tenants to sign up on our webpage to receive construction updates by email. You can find more background about this project on our webpage, including how the new street design will better organize the street to improve safety for everyone. 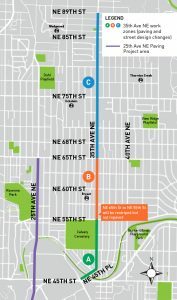 Once again, PLEASE, no bike lanes on 35th. The street is already to narrow and can’t handle it!